The only nozzle series you need! As you know our goal at Emvio Engineering is not to shift boxes. We want to stock unique and value adding items. 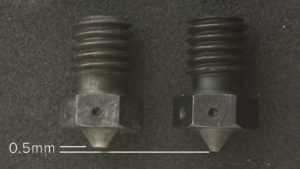 This is the reason why we are now working with Olsson Ruby to bring the most hardwearing nozzle to the UK! 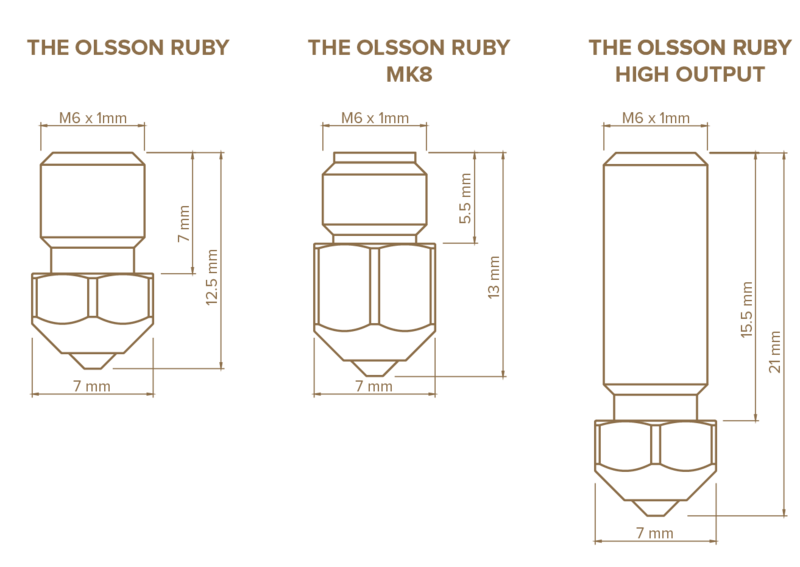 The Olsson Ruby is an invention by Anders Olsson, the man that gave the Ultimaker community the Olsson Block. 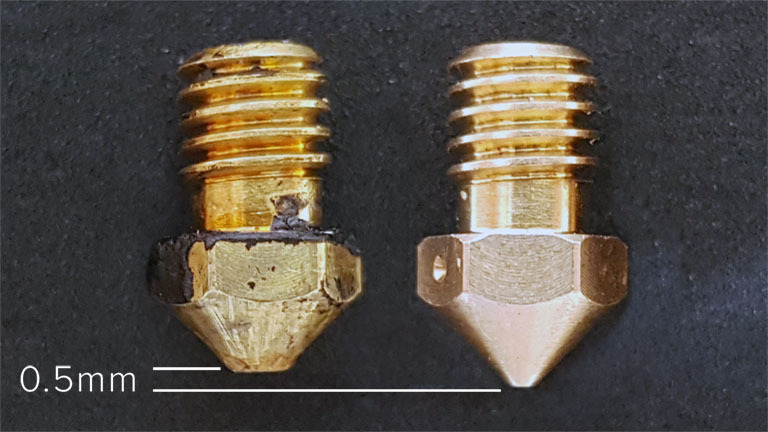 The back story of the Olsson Ruby is one that has inspired us and as one member of our team is well versed in hard metals and materials, it really hit home how elegant the nozzle is. The Olsson Ruby consists of a precision machined threaded brass body and a perfectly ground ruby tip. Rubies, being aluminium oxide, is extremely hard wearing but unlike some of the other ceramic equivalents has a better thermal conductivity. Best of all, the processes involved in machining it have been established for centuries. Ruby is the watchmakers hard material of choice for jewel bearings after all. First, I tried a few hardened nozzles and I had thermal issues. I also did try steel but it was like putting my finger in the air to find new standard print parameters each time. The fantastic value and quality Craftbot 2 has got a bigger brother! Did we mention we love our craftbot? Top quality bars and linear bearings are used in a well made precision bent steel box chassis. Mouthful to be sure. The kinematic system is AWESOME! 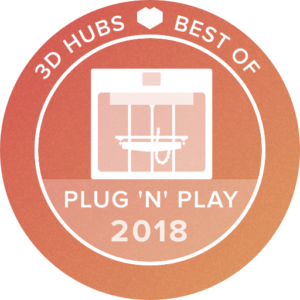 CoreXY here people! Two stepper motors working in unison on one endless timing belt give not only rigidity but also sooo much moving force. This makes the Crafbot able to print at higher speeds than equivalently price machines and even some of the more expensive ones. The Mosquito hotend is what started the Slice Engineering journey. Designed to have a small form factor, low mass, short retraction, and optimized heat transfer, the Mosquito uses the highest grade materials available, all engineered and built for performance in the USA. Mosquito is built to accommodate standard 6 mm heater cartridges, 3 mm thermistors, and RepRap style nozzles (as made by E3D, Microswiss, Olssen Ruby, etc.). We also highly recommend the use of Capricorn XS tubing during installation to achieve the best printing results. If you can source some super fast 50W heaters then these puppies will FLY! There is a reasonable selection of adapters to allow you to mount the Mosquitoes on the Bondtech kits as direct drive or bowden. Bondtech have created a specific BMG extruder for use with the Mosquito Hotends which couples them using two cap head screws. This increases the torsional stiffness of the hotend making swapping out nozzles a one handed operation. The Mosquito Magnum uses the highest grade materials available, all engineered and built for performance here in the USA. Mosquito Magnum is built to accommodate standard 6 mm heater cartridges, 3 mm thermistors, and RepRap style nozzles (as made by E3D, Microswiss, Olssen Ruby, etc.). Pack includes Hotend, 25mm Fan and tools. This highly hyped name stems from the fact that the CB3 has some inbuilt monitoring systems. The hype though is real and we can definitely see this machine matching and beating the other IDEX systems. Based on the typical Craftbot steel frame, the team have taken on board good practice in kinematic element design to ensure that the 3 axes are perpendicular. The hotends are totally redesigned, integrating a titanium heatbreak, a very sturdy antirotation feature and convenient connectors everywhere to make maintenance a joy. 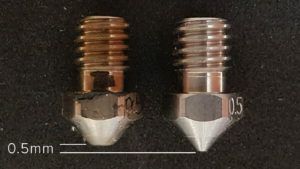 As you may already know, titanium has very poor thermal conductivity making it the ideal material for a heatbreak of a hotend capable of 300 °C. As with all new Craftbots, the units ship with the latest stepper motor drivers by Trinamics, making printing as silent as possible. The team have also improved the Wifi capability of the machine allowing for faster transfer of GCode. It can also send you an email if it detects printing issues. Failure detection from clogging or grinding is done with the assistance of two encoder wheels that measure how much filament has passed through. this is compared to the the length of filament called for by the GCodes and if there is a discrepancy, recovery measures are triggered. Alignment of the hotends is done using the typical vernier type scale in the X and Y direction while in the Z direction the height is adjusted mechanically. The latter allowing ditto and mirror printing with minimum effort. One of the best aspects of working with CraftUnique, apart from the team being really nice people, is that they listen to their customers. That is why, in the new CB3 the build plate has been beefed up, a status LED has been placed behind the logo and improved WIFI capability. 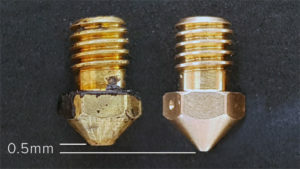 Another cool point is that the hotends take M6x1 threaded nozzles making the CB3 commpatible with the Olsson Ruby and other similar speciality nozzles.